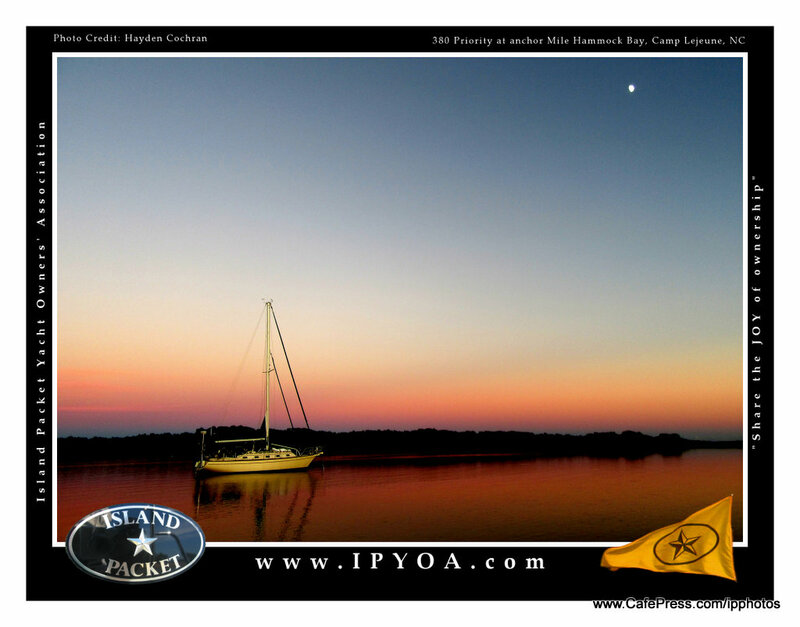 I am very happy and proud to announce the 13th year edition of my Island Packet Yachts Calendar. 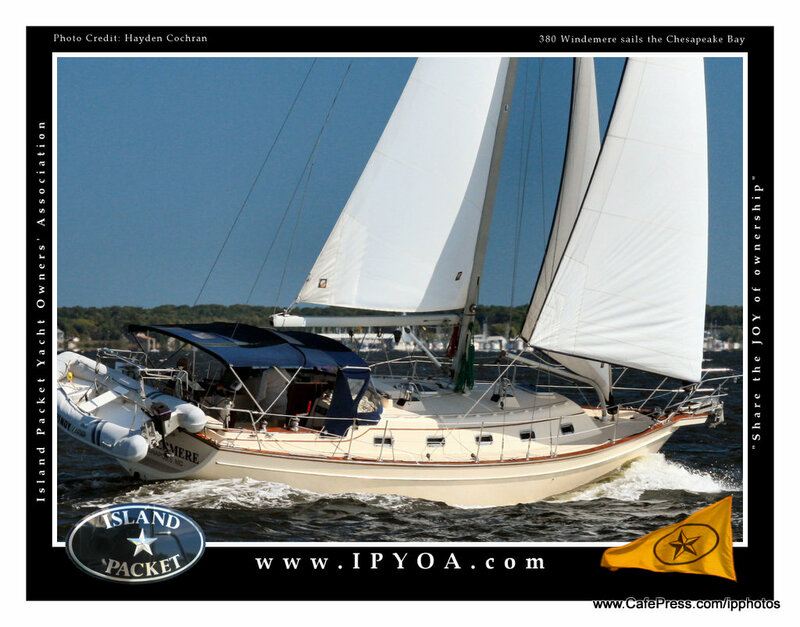 Usually I have this completed by mid November, but this year I have been working very hard on moving 11,500 Island Packet Yacht owners’ photos and thousands of photo albums from the server at IPphotos dot com into the new and upgraded web server at www.IPYOA.com/photos. This project has taken all my spare time and great effort since the Annapolis Boat Show on October 9th. Now that we reached Marathon, FL and taken a break at our “happy place” www.HarbourCayClub.org, I have found time to build the 2016 IP calendar. 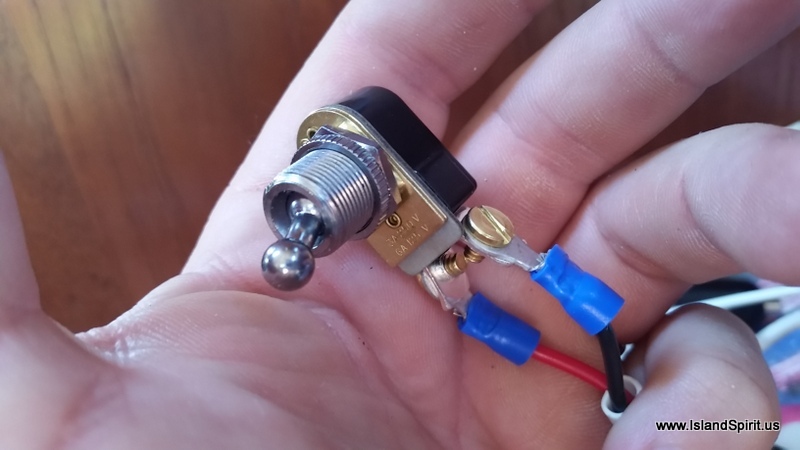 This seems like it should be an easy project. Simply select 12 photos, slap them into a calendar and release it. Not so, this edition took me 25 to 30 hours to create, I spent a day in the Marathon Public Library and two full days working on board IP 35 Island Spirit. I am very happy with this latest edition. I looked through 5,000+ photos to arrive at these 13 images. 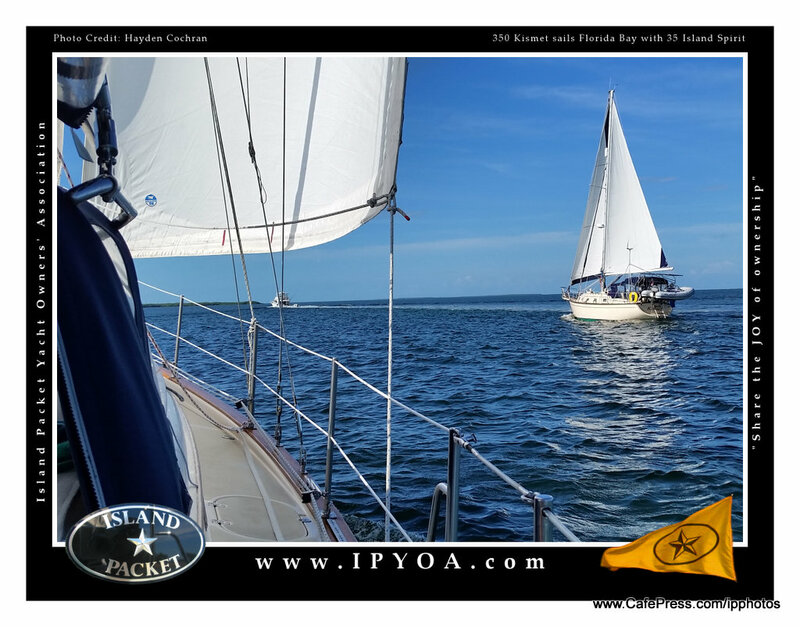 Note: I have 110,000 digital photos I have taken on my laptop, 90% of which are Island Packet yachts and sailing scenes, so I have the material. 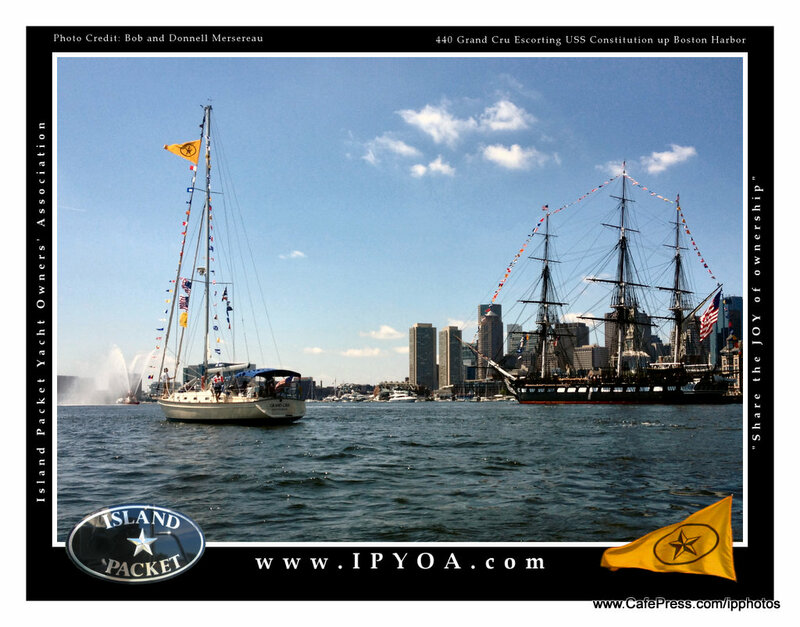 The best aspect to the IP calendar is when owners send me great photos of their sailing adventures. 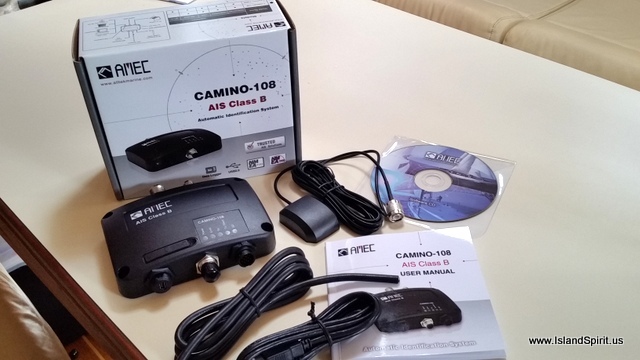 This year we have included several such wonderful additions from IP owners. 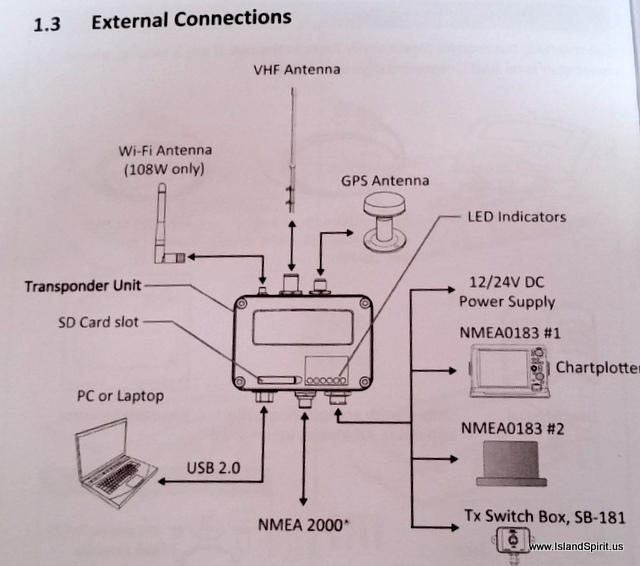 I enjoy creating this product for Island Packet owners. The $5.00 proceeds from each calendar help to pay for some of the fees during the year to upgrade and run the www.IPYOA.com website where 3,000+ members have shared over 16,000 digital photos. This web site is now serving nearly 20,000 page views per month and more people are joining daily. I enjoy the sharing, learning and community spirit of the Island Packet Yacht Owners’ Web Site. I hope you learn from it and enjoy the sharing as well. 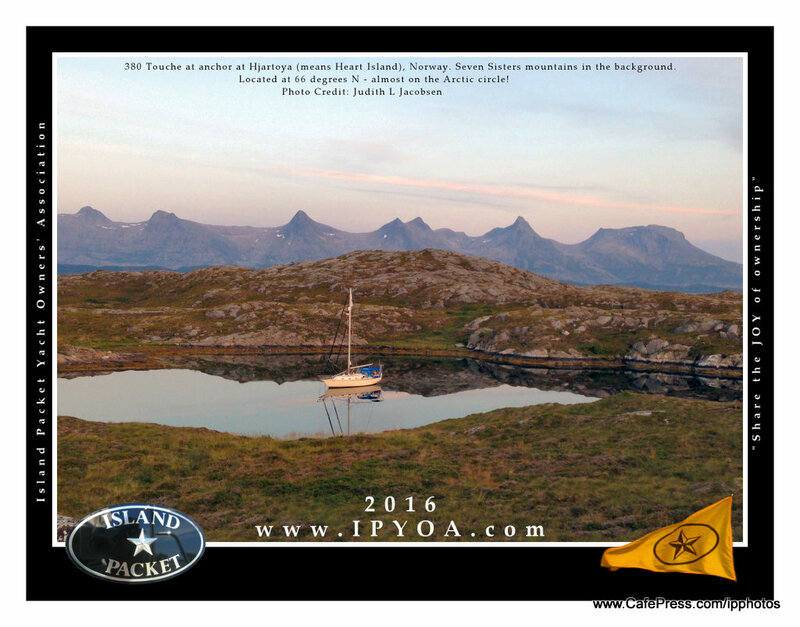 Here are the photos in the 2016 IPYOA 13th edition calendar. NOTE: Click on each photo. They are full screen images, 1024 x 768 pixels. 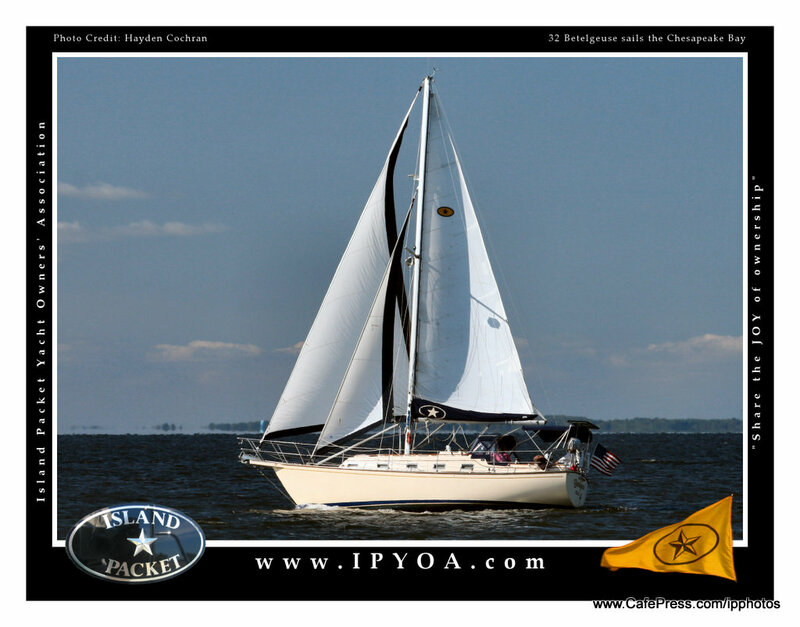 Thank you for enjoying our Island Packet Yachts! 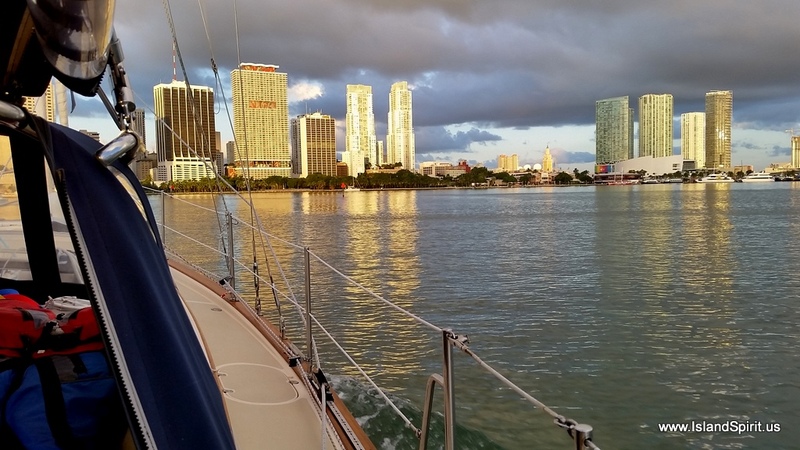 After spending just 23 hours in South Beach, we sailed 50+ miles south down Biscayne Bay, raising sails right off the Hard Rock Cafe in downtown Miami, near Brickell Point. 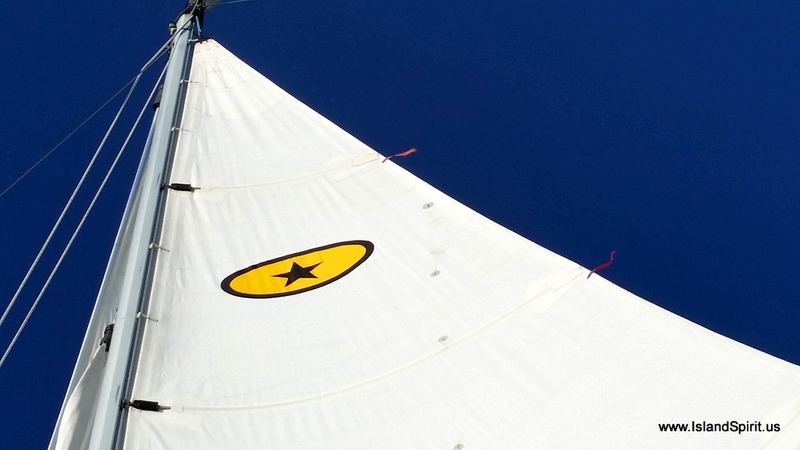 Reefed main and jib, 25-30 knots on the beam in flat seas, perfect! 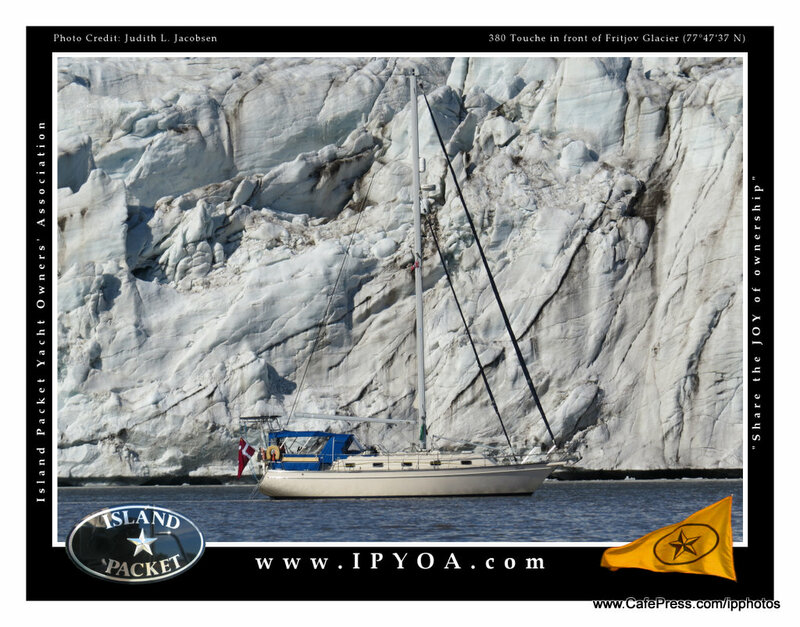 In the stiff 25 to 30 knots of east winds, IP 350 KISMET and Island Spirit sailed at hull speed all day. 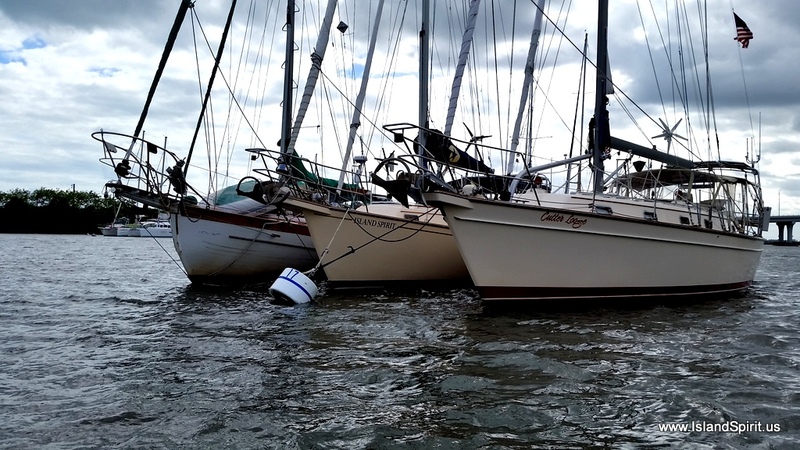 We had a reefed mainsail and a reefed 135 jib and, when the winds would drop to below 22 knots, we said…”Hey, who turned off the wind?”…we loved it, This will go down as one of the best sailing days in years. 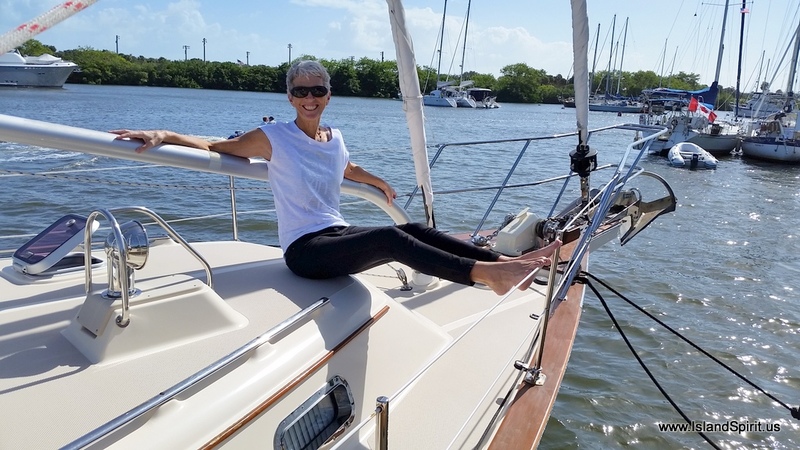 Beam winds on Biscayne Bay, flat seas, as in only one foot high, sailing hull speed and loving it along with Kismet! 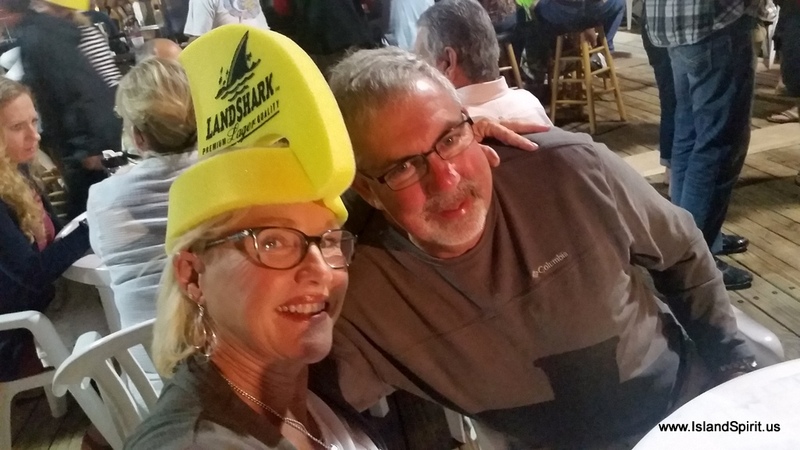 Jim and Laurie are well known for their IP sailing skills and they actually sail more of the time than any other IP owners we know. 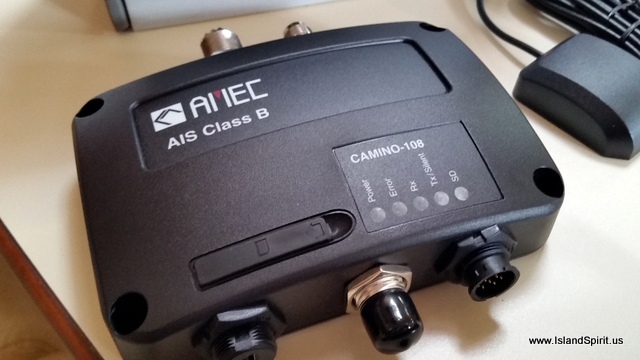 They are masters at making their IP move well and they are also very hard to catch up to. It was really a spectacular day of sailing. 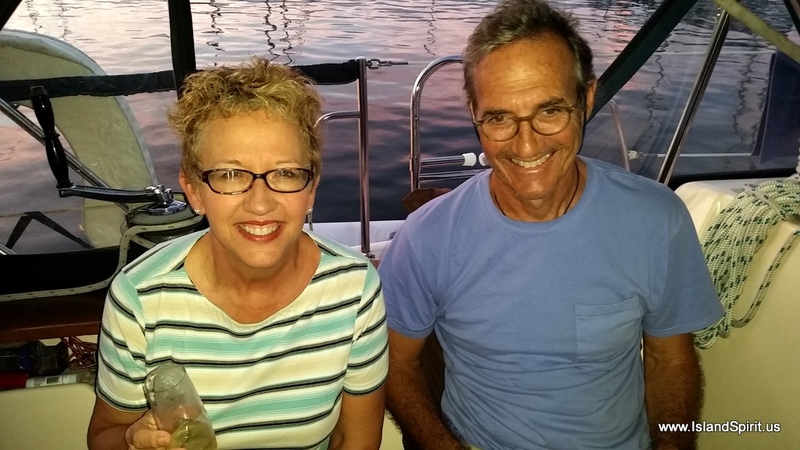 We reached Tarpon Basin off Key Largo and there Laurie and Jim hosted us to a delicious BBQ dinner. We had a lovely night on anchor recapping the terrific sailing day. What a beautiful place Tarpon Basin turned out to be, like anchoring in a large round bowl. 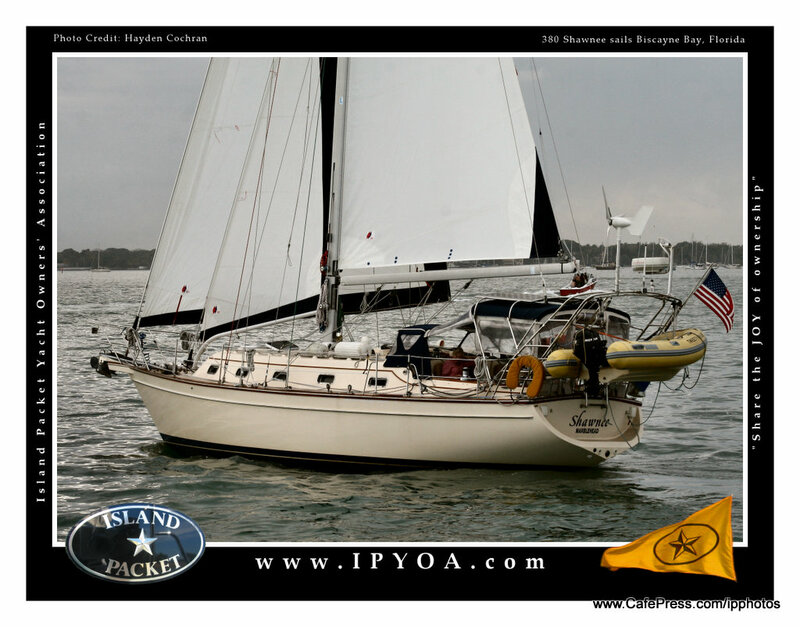 This was our 7th leg up and down the Keys, but we have never sailed down the Florida Bay. We usually run this area in two days, anchoring at one of the few suitable spots, Rodriguez Key. 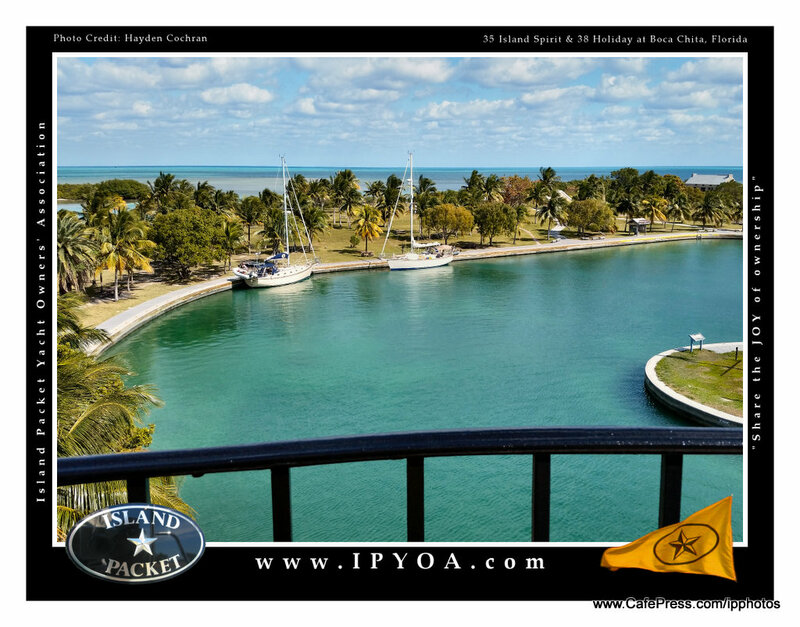 We really liked this side of the Keys as there are so many places to anchor and go ashore. 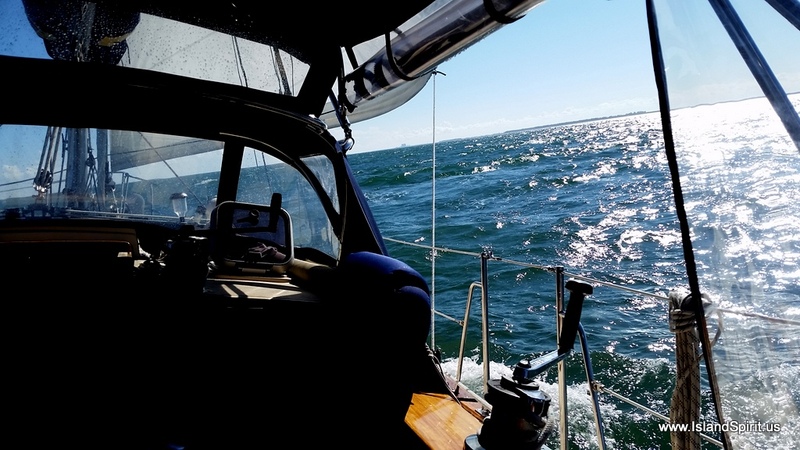 With 30 knots of east winds, that was not an option and the inside route was very calm. 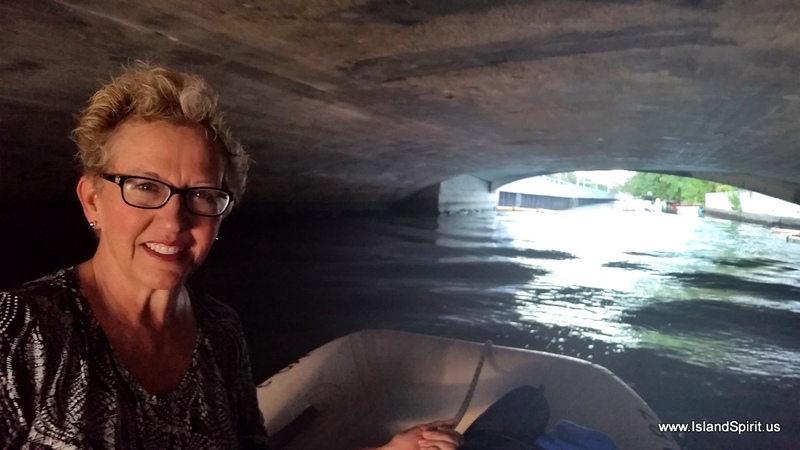 Thanks to Laurie and Jim, we now know of another great place to sail. Beautiful! Leaving Miami over our stern, always a sad sight for us, We love this city. 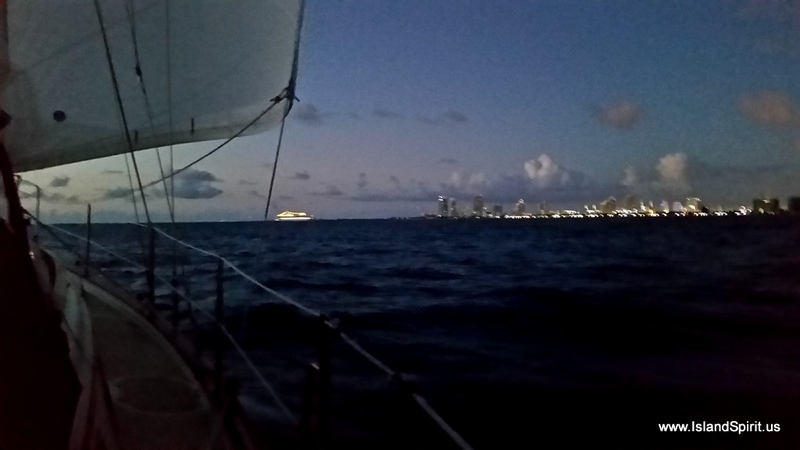 The final view of Miami while sailing south. That is IP 350 KISMET way ahead under our jib. 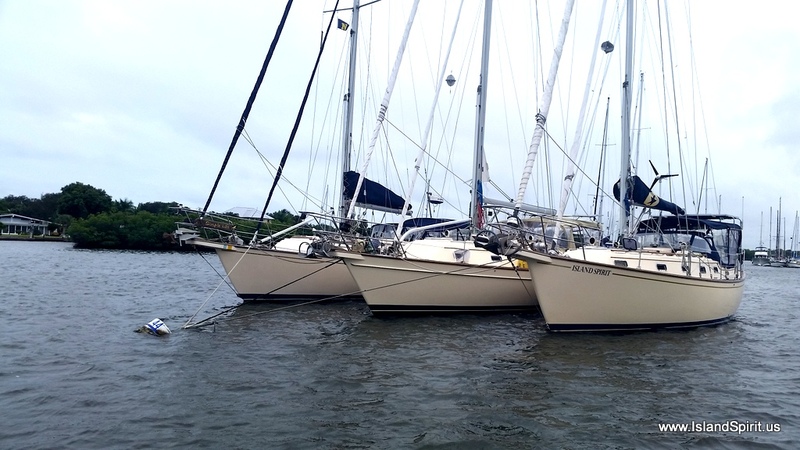 IP 350 KISMET, before snagging the first crab pot of their sailing career! 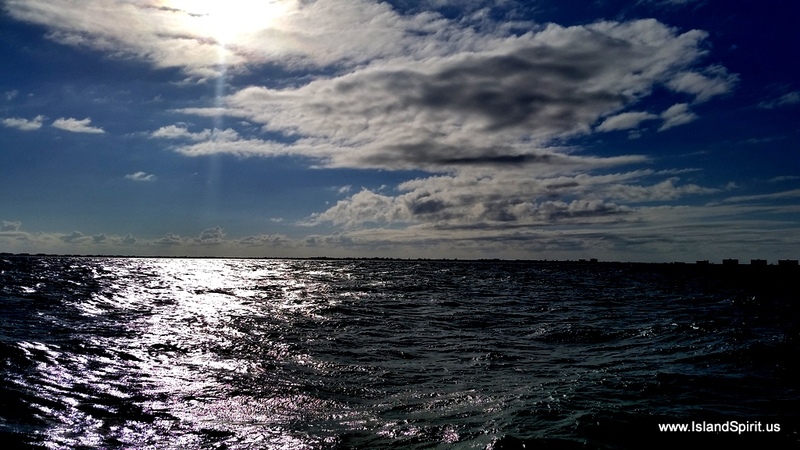 The next day was a bit more calm, with only 10-14 knots of south winds. We were able to sail 30 nm from Tarpon Basin to Channel Five, dropping the hook at Jew Fish Hole, just to the SW of Channel 5 and Fiesta Key. Sailing a lovely 30 mile day in calm seas with a south wind. I love to sail close hauled, look at that wind angle. The jib is against the spreader tip and the movable jib car is all the way aft. Dinner on Island Spirit with Laurie and Jim, friends since 2008. Radeen and Hayden, enjoying another memorable evening. These last few days of sailing and learning a new area were really fun. 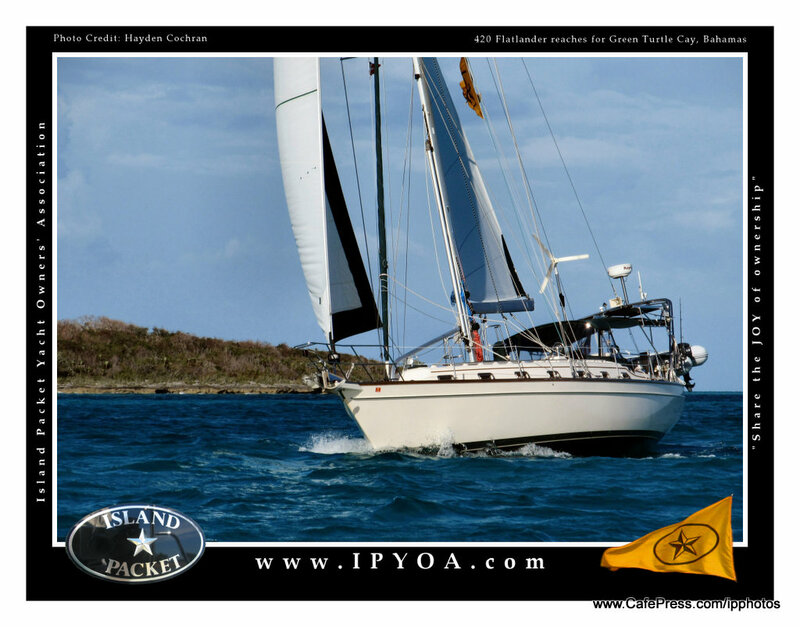 Thanks to IP 350 KISMET for showing us the Florida Bay side of the Keys. We hope to learn more about this great area. Tomorrow, it is time to move into Harbour Cay Club in Marathon and take our scheduled one month Christmas docking break. Thank you for sailing along! 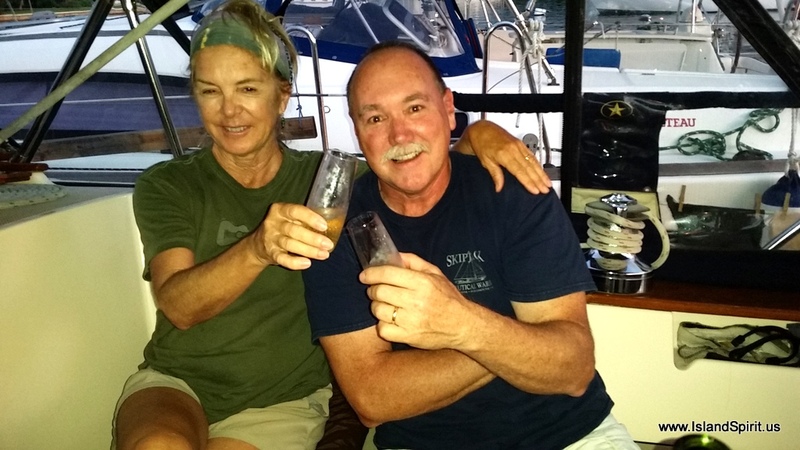 On Friday, we said good-bye to Ron and Mary Ann of IP380 CAVU who watched our boat and had us over for champagne and delicious snacks when we returned. We blasted offshore from Vero Beach via the Fort Pierce inlet and turned south, running 1 mile offshore for the 100+ miles to Miami. 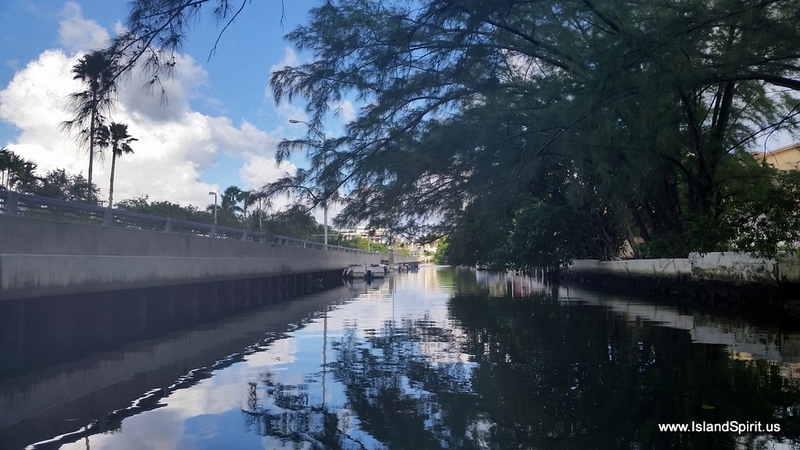 After 21 hours, we entered Government Cut Inlet at daybreak, ran the channel into the Miami waterfront, turned north and then east to South Beach. Arriving South Beach at 9 am, we made breakfast, talked to Jim & Laurie on our buddy boat IP 350 KISMET, and promptly went to sleep. 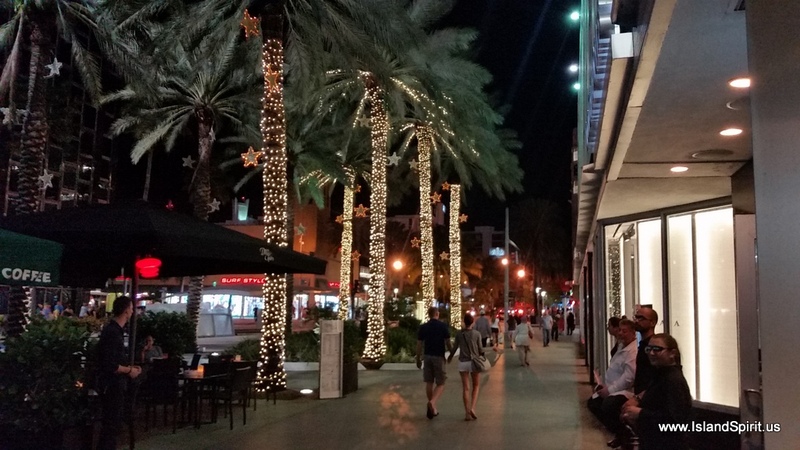 Our plan, as outlined months ago on our calendar, was to attend the South Beach WALLCAST. 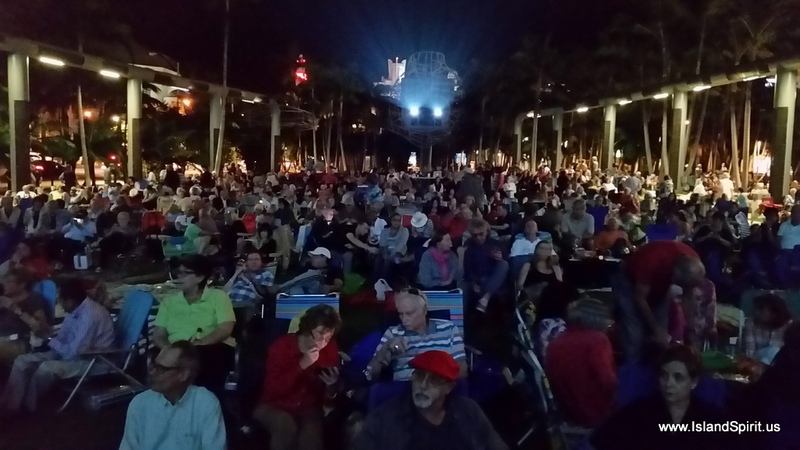 The New World Symphony School event is the number one SoBe venue on TripAdvisor. We did it! 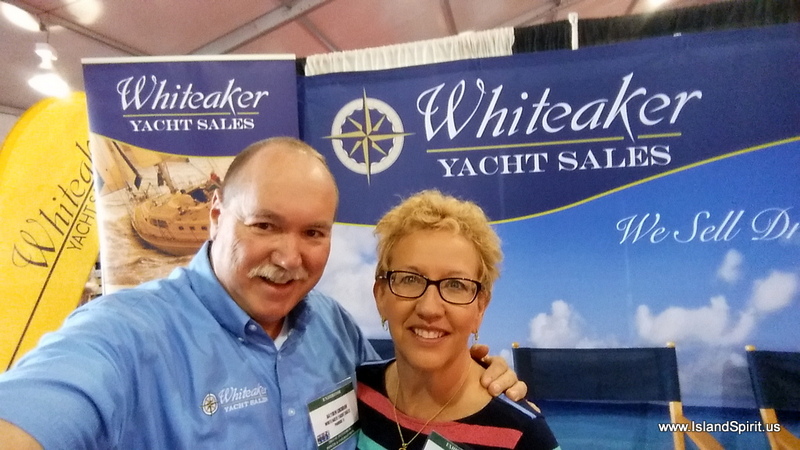 After all the work with the Boat Show and showing a boat in Hilton Head, SC was over, we were so happy to be here. 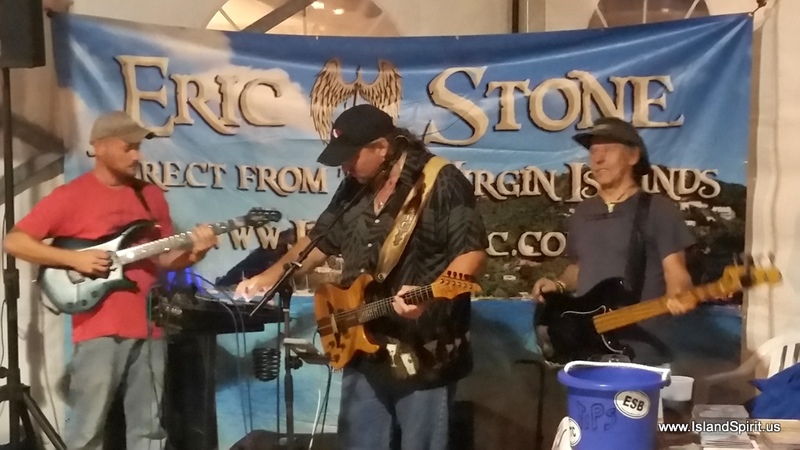 We have now attended 6 Wallcast concerts and we will make the next one in January, too. This is a NOT TO MISS event if you are in the area. Truly amazing! To learn more about SoBe Wallcasts, see this link. Sailing offshore was a great trip, we had 15-20 knots on the beam all night long. 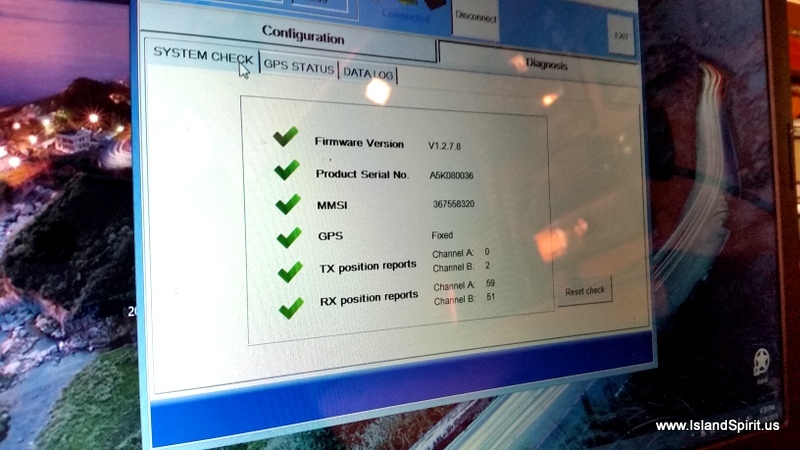 We sailed a jib only and added 1500 rpms on the motor to push through the 3-4 ft waves running at 4 second intervals. 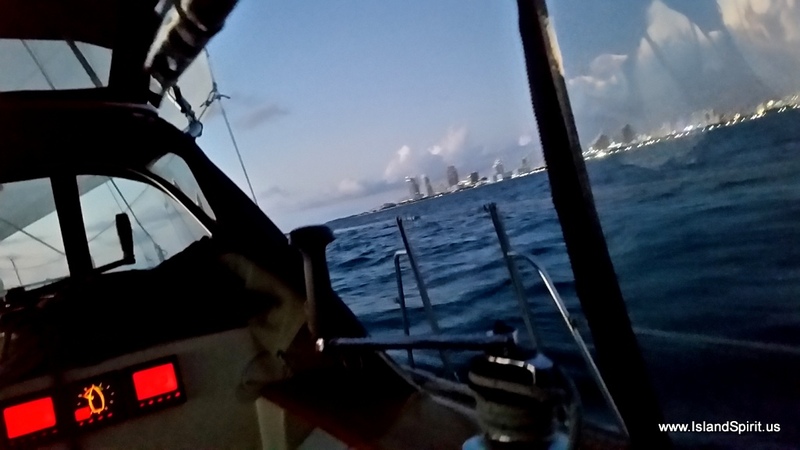 This kept our speed at 7 knots as we wanted to make Miami at daybreak, which we did. A beautiful sunset, confused seas. Welcome to Miami South Beach at first light. A cruise ship visible under our jib, returning to port pre-dawn. Looking back out to sea past Fisher Island condos with sunrise in the inlet. 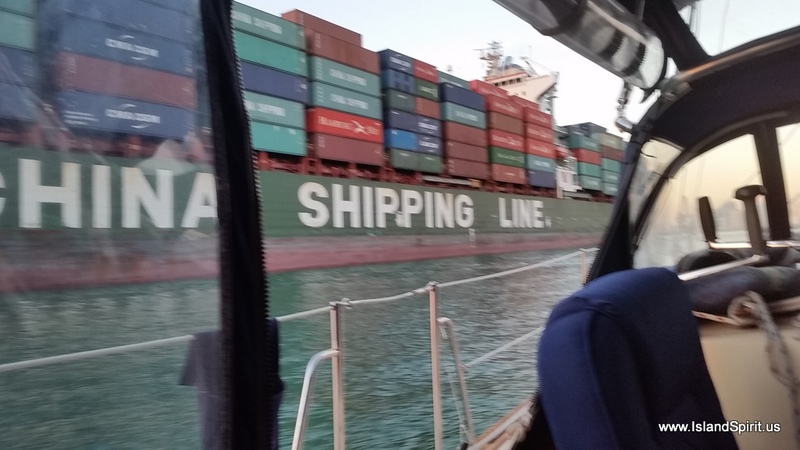 Large container ship heading out to sea. Look at these containers. They are tractor trailers stacked 14 rows wide and 6 to 7 + high. 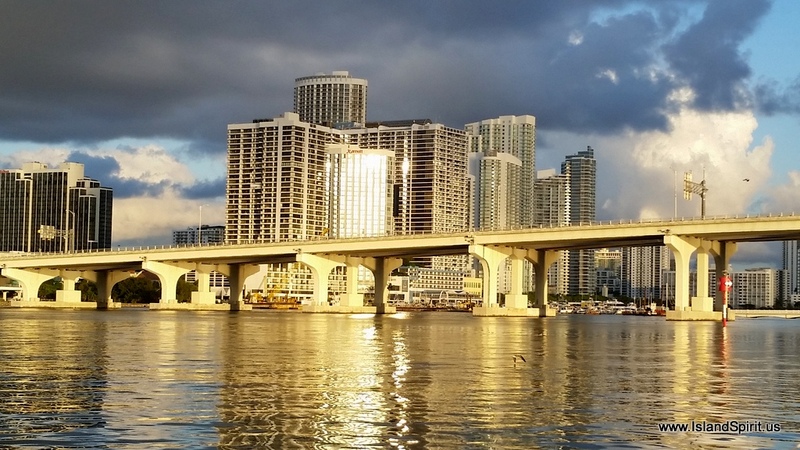 Arriving City of Miami in the sunrise, beautiful! Anchor down off South Beach, 9 a.m, We did it, now time to rest! 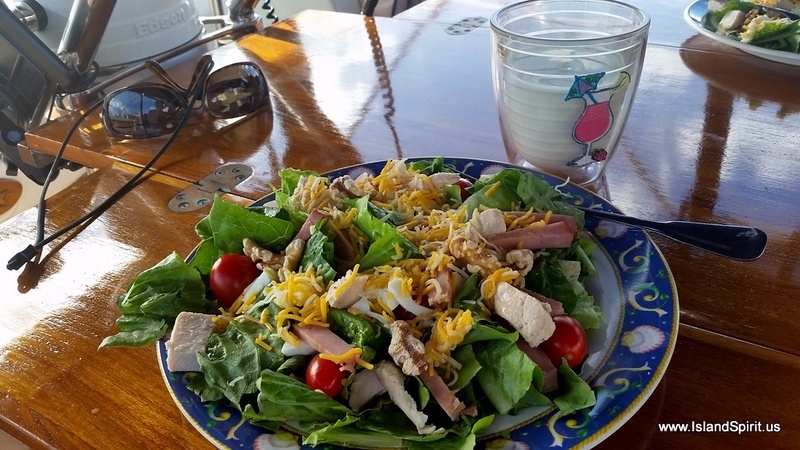 Radeen made a great salad for lunch, I rarely blog about food, but this was beautiful. 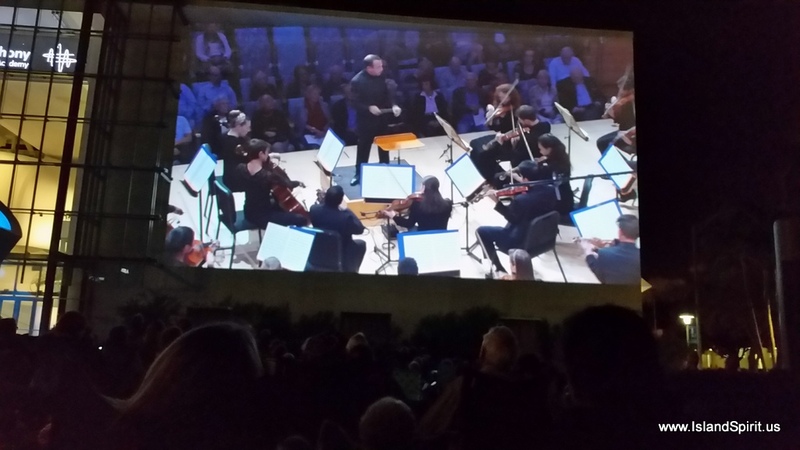 Tonite’s program was The Music of Vienna, by Strauss and Brahms. Fun, fun, fun! Looking at the park from the screen, Those blue lights in the back are from the large projector. The 7,000 sq.ft. Wallcast screen on the side of the Symphony School’s building. former associate conductor of the BBC Symphony. He gave a fascinating introduction. Very cool! 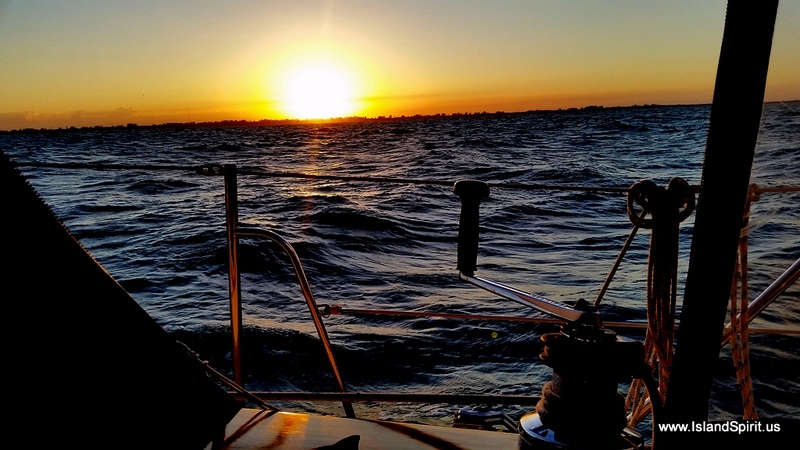 After only 23 hours in South Beach, we lifted anchors at 8 a.m. Sunday with IP350 KISMET and sailed together on 25-30 knot easterly winds south into the Florida Keys. More to follow! 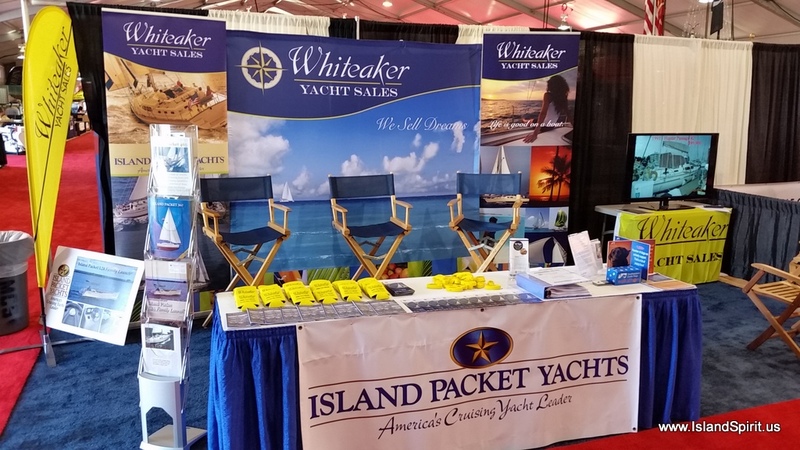 Our time in Vero Beach, Florida has passed quickly as we visited with friends, attended the St. Pete Boat Show and worked with our friends who are buying their first Island Packet Yacht. 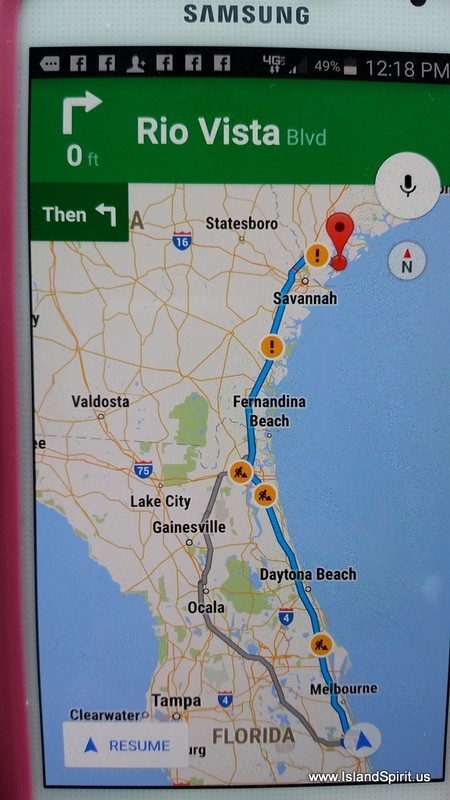 Rental cars, driving across the state and a road trip north to Hilton Head Island, South Carolina all made for a very busy time. Now, we need to push on and head south to Miami where we plan to make our 6th South Beach WallCast, a venue not to miss if you are ever in the area. 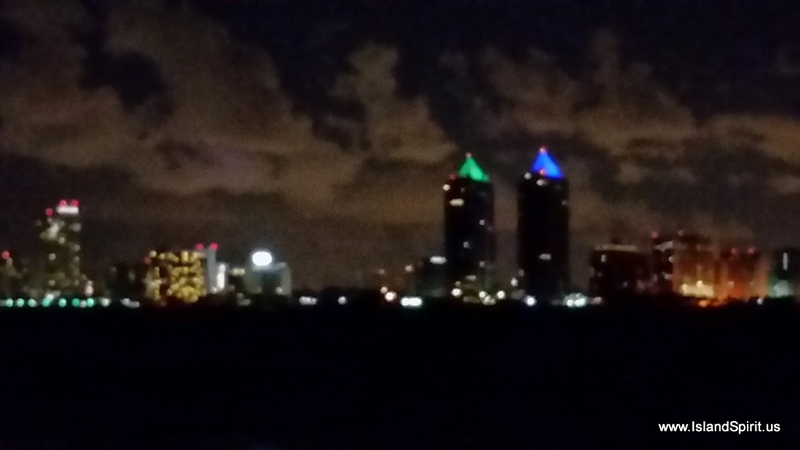 We actually make SoBe our destination many times as we sail south. After a one day stop in South Beach we plan to push on to the Keys where we always dock at www.HarbourCayClub.org and take a relaxing Christmas Break there reconnecting with the great people of HCC and several transient IP owners. 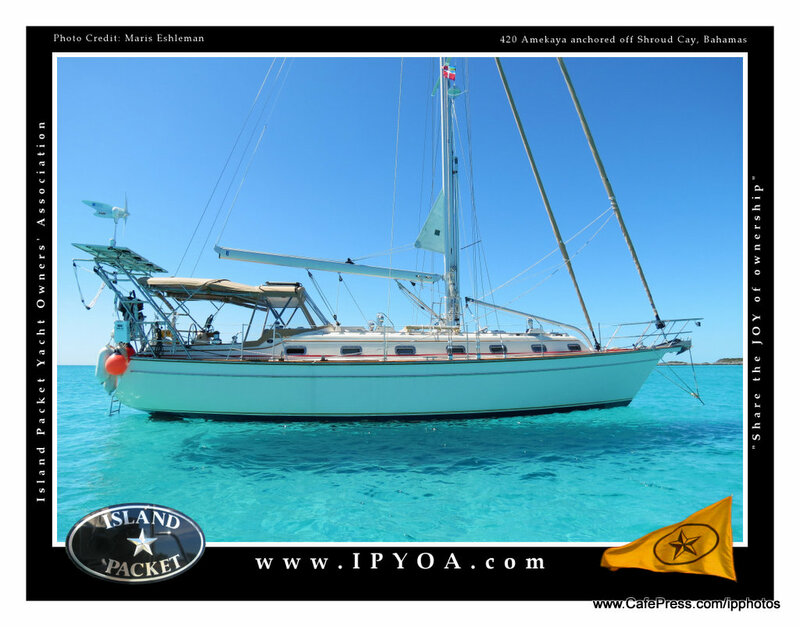 Our plans after Christmas may include the Dry Tortugas off Key West and the West Coast of Floridac before heading off to the Exumas.The only plan to to go when the weather is good, which is the normal plan for cruising. 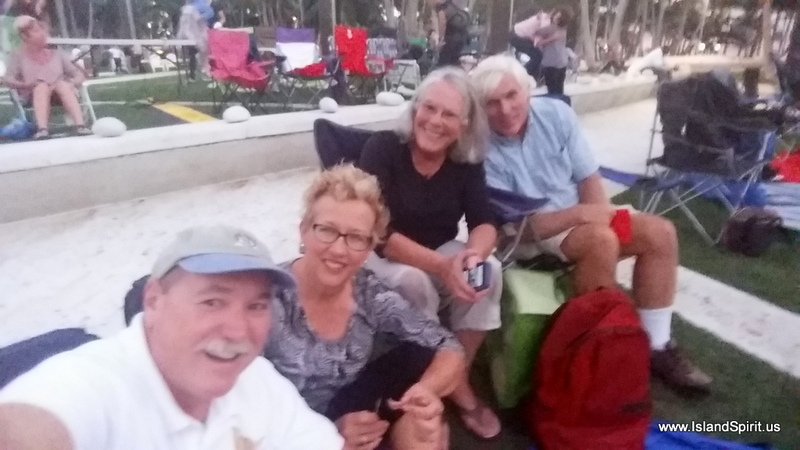 We have really enjoyed our time here in Vero, rafted up to great friends Ron and Mary Ann of IP380 CAVU and Joe and Michele of IP37 Simple Life. 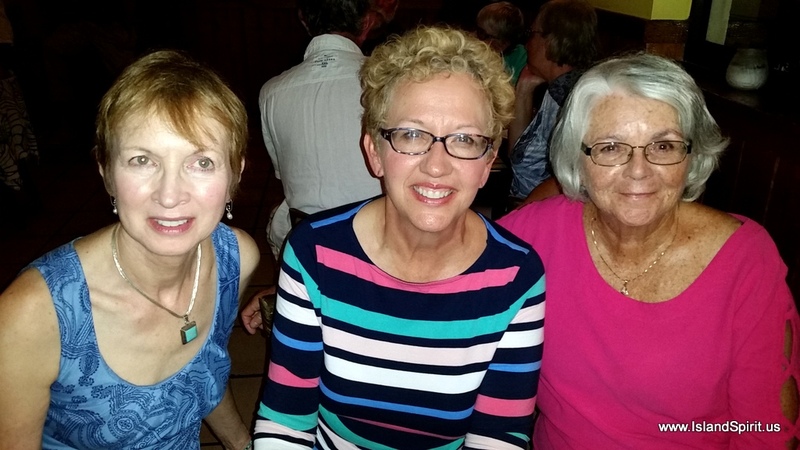 It is wonderful to share this cruising adventure with good friends. We shared meals, happy hours, shopping adventures, cocktail parties and the good life. At the Thursday night happy hour, we met Forest and Susan (and Doddle puppy Mocha) of IP 44 Rejoice!. Other highlights were visits with Eric and Kathy of IP380 Tianui and Maris and Linda of IP 420 Amekaya, a leisurely beach side lunch with Greg and Sharon of IP40 Dream Catcher and yet another bottle of champagne shared aboard CAVU. Moving on from Vero is always difficult because the town is such a great place and the good friends you share it with make it even better. 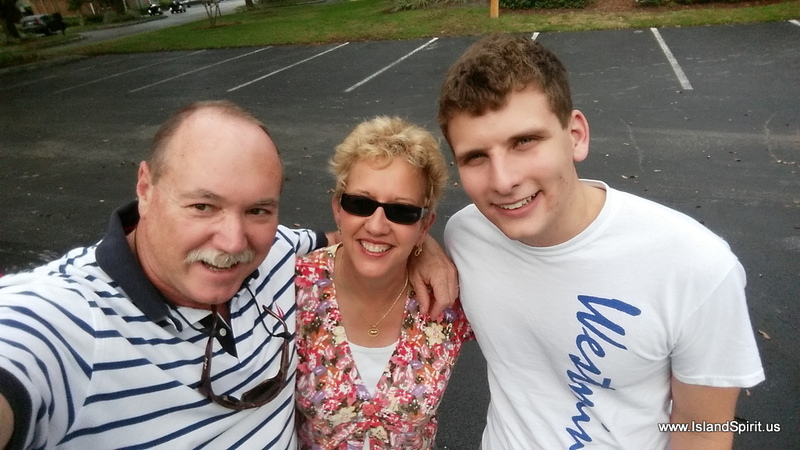 Visiting our good friend Nicholas, who is a PhD student in Tampa. Thanks for the guided tour of FSU and congratulations on your first semester complete! 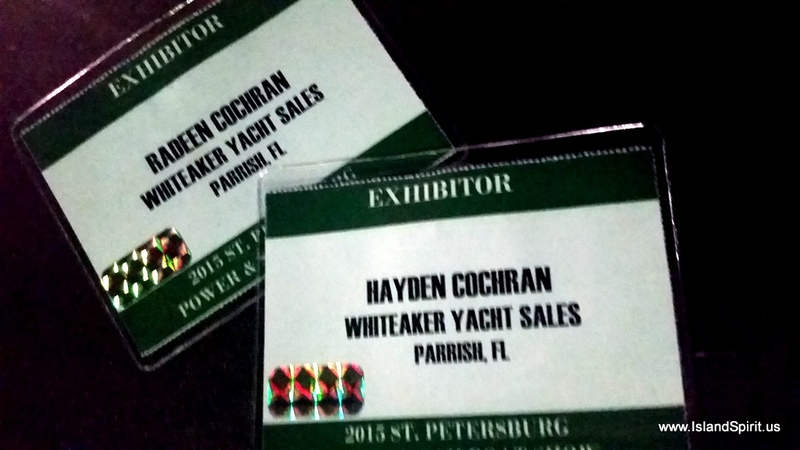 We were here Sat and Sun and met with IP owners and folks shopping for boats. Look, we are official. Thank you, Debbie and Ed! 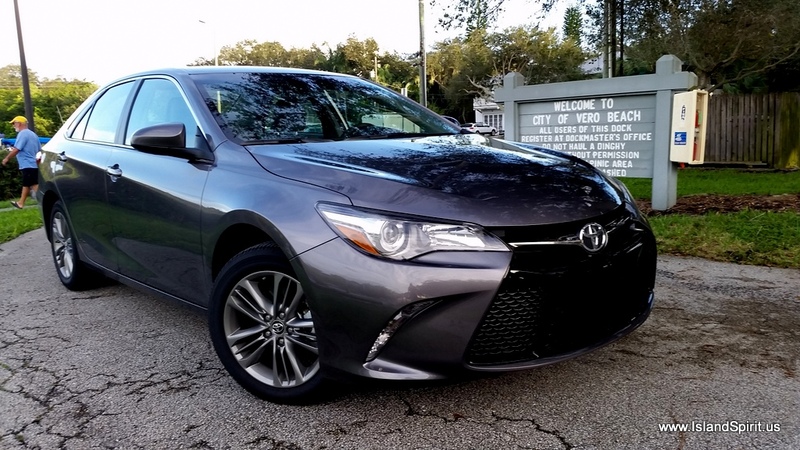 Yacht Broker Camry rental for the week. Mary Ann and Ron of IP380 CAVU put the the first 200 miles on it. We returned it with 1,700 miles! Love that new car smell! So, as you can see, it has been a busy week and we have really enjoyed our time here and in St. Pete and in Hilton Head on survey. Onward now to South Beach Miami and the Keys. 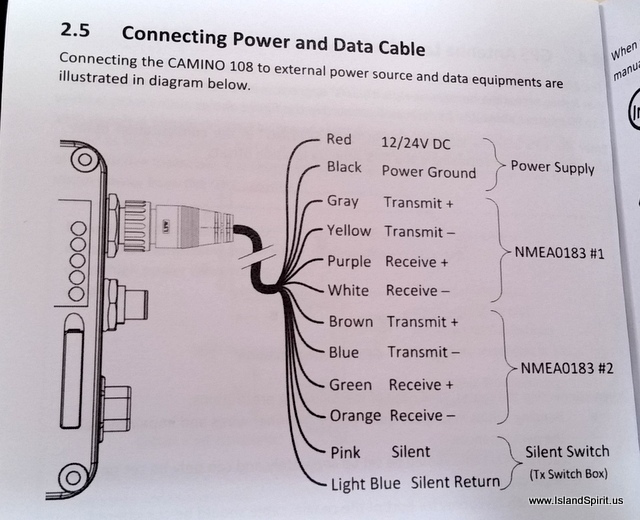 Where are we and what have we been doing? 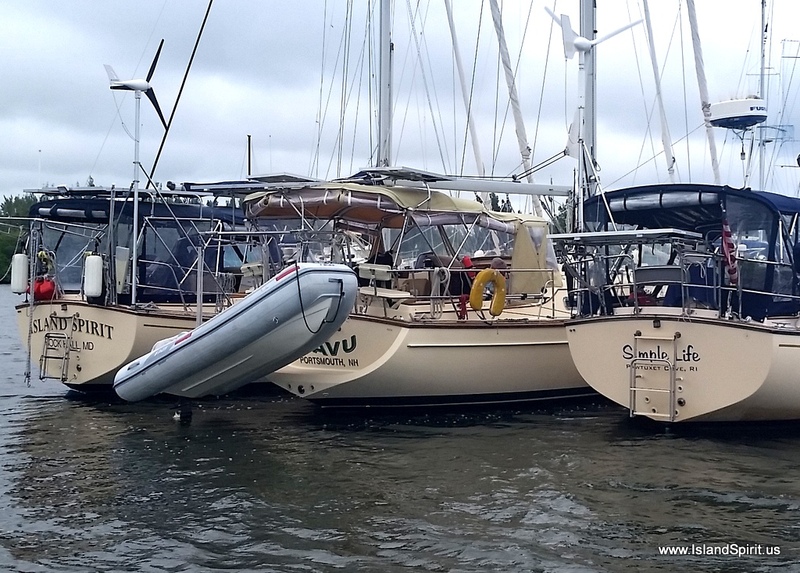 We seem to not be keeping up with the blog and that is because we are: Running the ICW, Visiting Boat Buddies, Installing AIS, Building a new web Server for IPYOA, Importing 16,000 photos into this server, Servicing my Yacht Broker clients and enjoying a happy, busy time. 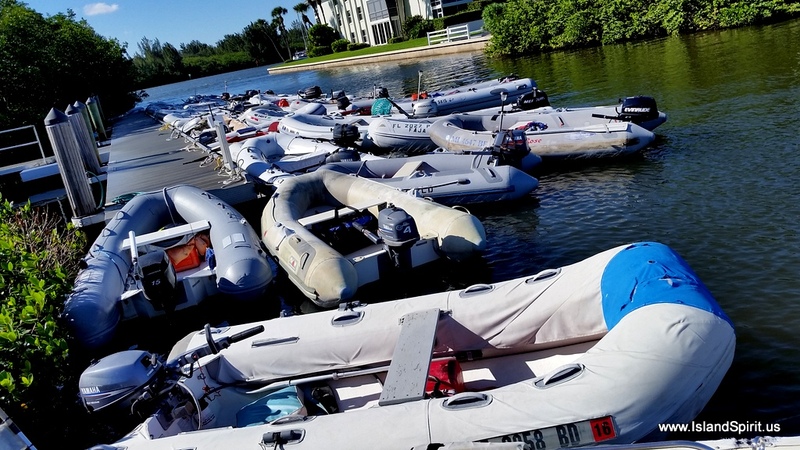 This may be too busy with too many items colliding together all at one time, but at least we are set up in Vero Beach, Florida, at the city marina mooring field and we can stop moving while we attend to all the non-cruising activities we are involved in. Since we left St. Augustine, we motored 5 days down the ICW along with our good friends and boat buddies, Eric and Patricia, of world famous www.CutterLoose.com. 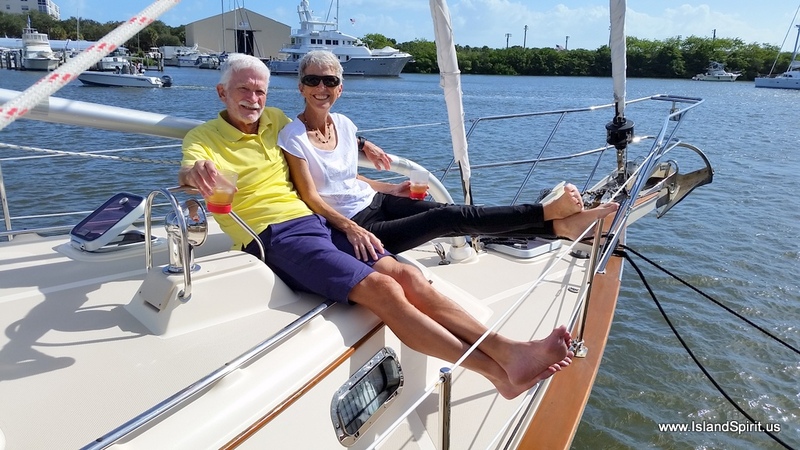 Eric and Patricia returned last spring from 3 winters in the Caribbean and are now doing a review trip down the ICW from Maryland to Florida. We are lucky enough to be spending time together once again. It is like old times. 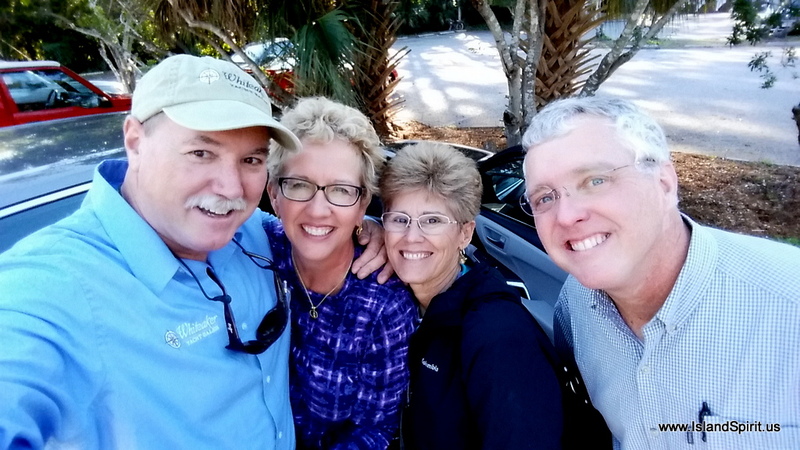 Once we reached Vero Beach, we were given a car by our great friend Carey, IP SP CATSPAW and we drove to Titusville, two days in a row, to show boats and to meet with my yacht broker clients. 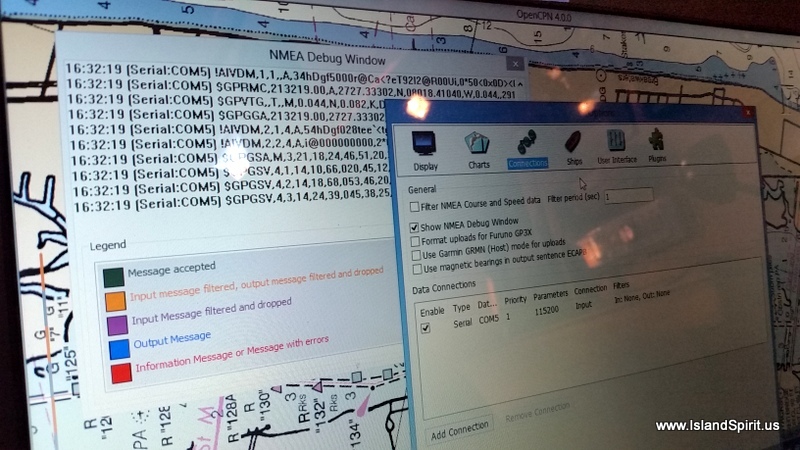 While in Vero, we were rafted up with IP 460 CUTTER LOOSE. We enjoyed our time here in Vero by walking to the beach every day, enjoying the coffee shop and the beautiful town. 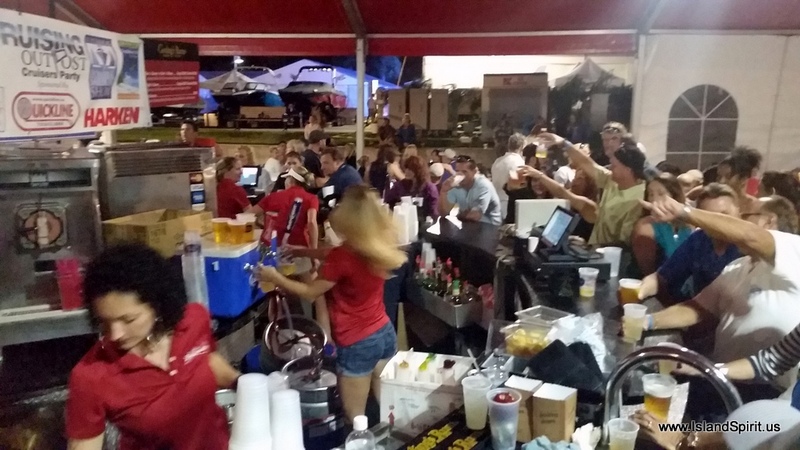 Thanksgiving was hosted for 200 cruisers by the City of Vero Beach and the local CLODS, Cruisers Living on Dirt. These cruisers cook the ham and turkeys and the boaters bring all the side dishes. Eric and Patricia and Radeen and I staked out our tables and took our place settings and chairs to the community center. Lucky for us, we checked it out about 1 hour before the event started and we acquired the last 4 seats at separate tables, unfortunately. After the delicious dinner, the local cruisers assembled their band for a live musical performance that was very entertaining and enjoyed by all. Of course, I grabbed a seat right up front, because live music is so wonderful to share. We really enjoyed this. After Thanksgiving, we had planned to depart, and depart we did for Fort Pierce where there is a wonderful farmers’ market on Saturdasy. 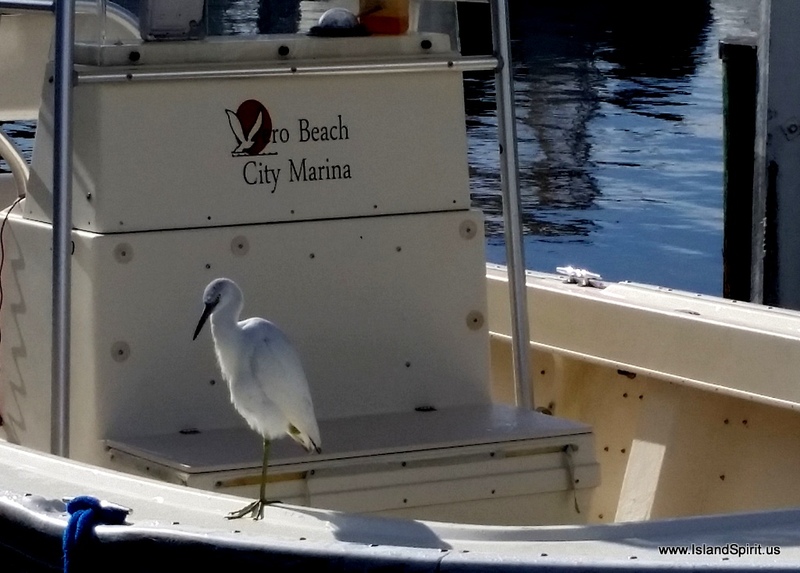 We left Vero and motored down to drop an anchor off Fort Pierce where we took our fast 15 hp dinghy across the harbor and into town. 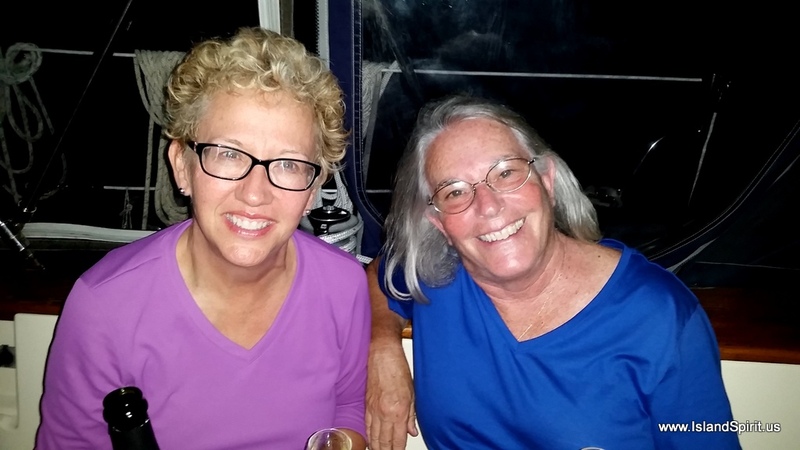 On friday night, we made arrangements to meet up with IP 370 Morpheus of London, Richard and Jan, who are into their third year of cruising with sights set on the western Caribbean and Central America this year. 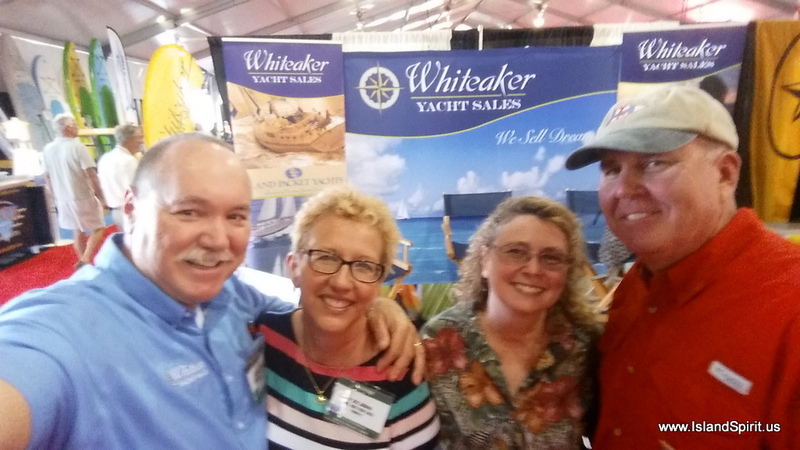 Eric and Patricia spent time with Richard and Jan last in the Caribbean and they enjoyed talking about their adventures together. It was great to hear Jan overview their upcoming plans and how they will explore Central America and then store the boat in Panama ready to cross into the Pacific the next season. 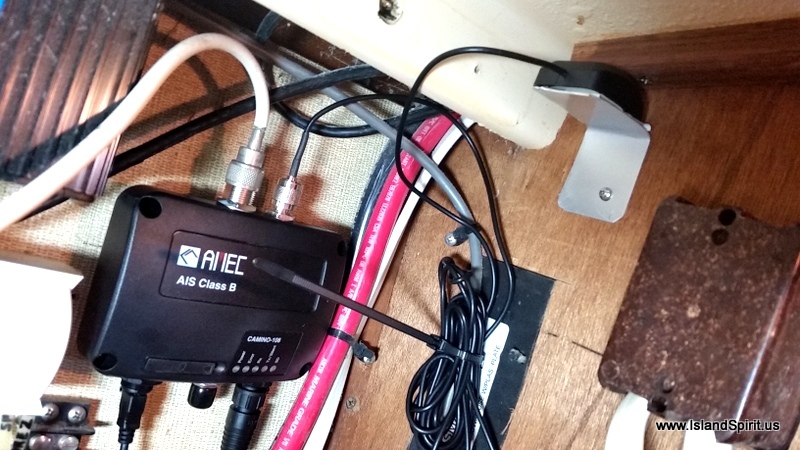 Meanwhile we stayed on anchor off Fort Pierce and installed our AIS system silent switch and rewiring to make this new AIS transponder a really cool install. 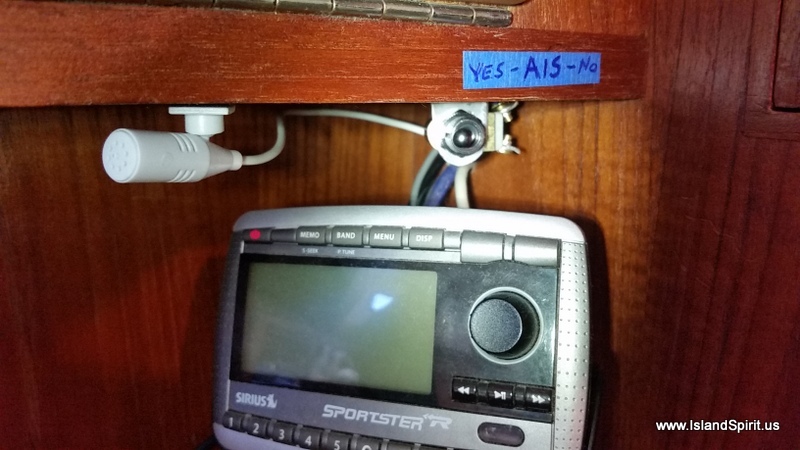 Last year we rebuilt our entire alternator and charging system right here on anchor at Fort Pierce, that took 4 days, so building an AIS system and setting up the laptop software was a piece of cake. 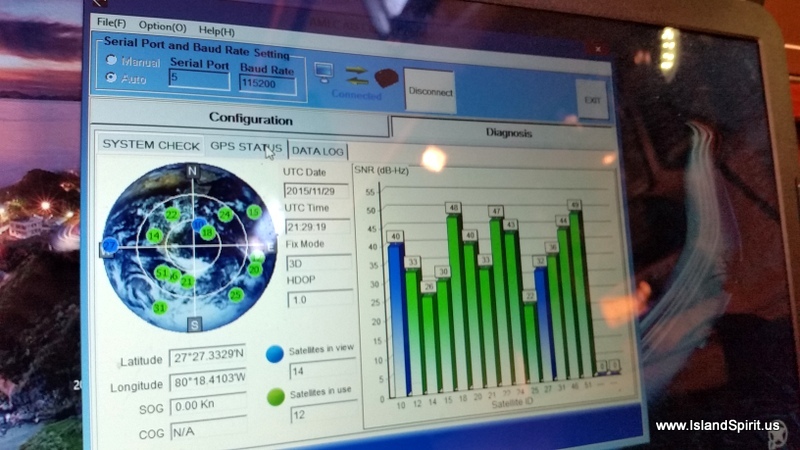 The system is working well and we now show up on Marine Traffic for all to follow. After 3 days on anchor, we needed to return to Vero, where we can secure our boat rafted up to IP 380 CAVU another buddy boat. Ron and Mary Ann (M.A. 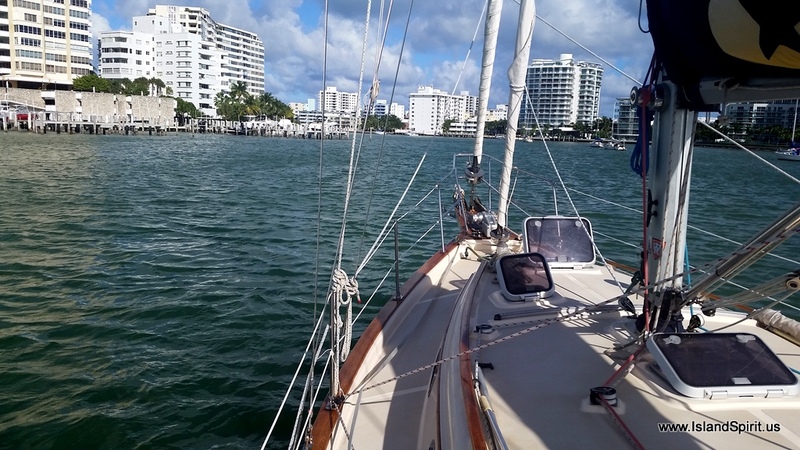 ocean sailing GrL) will be here for a few more weeks before moving onto Fort Lauderdale. 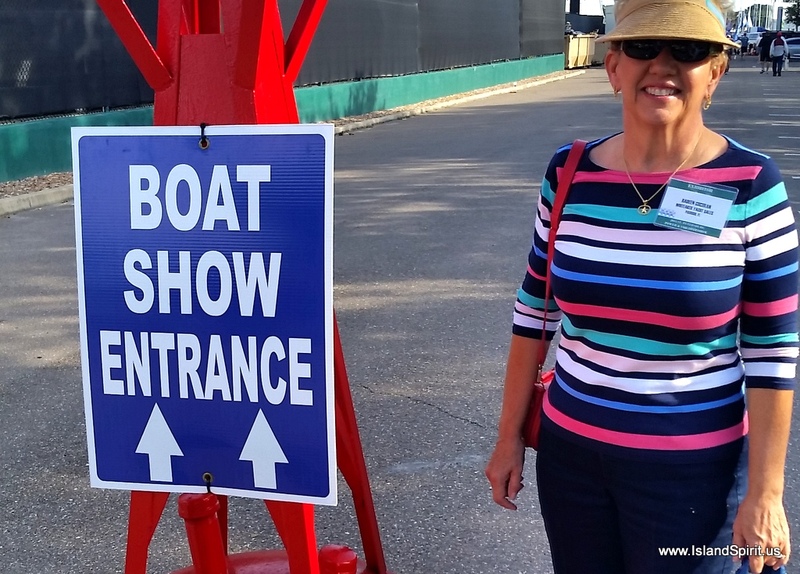 We will be renting a car for the week so we can volunteer at the St. Petersburg Boat Show, Sat and Sun. 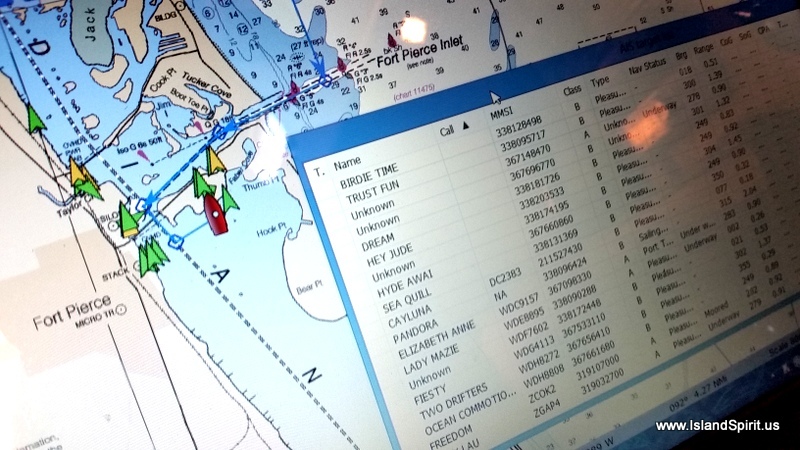 Then on Monday we will be driving to Hilton Head, SC to survey and sea trial an Island Packet 35 that my client is buying. After that, we plan to return to Vero and head to sea ASAP, pushing onto Miami, FL. 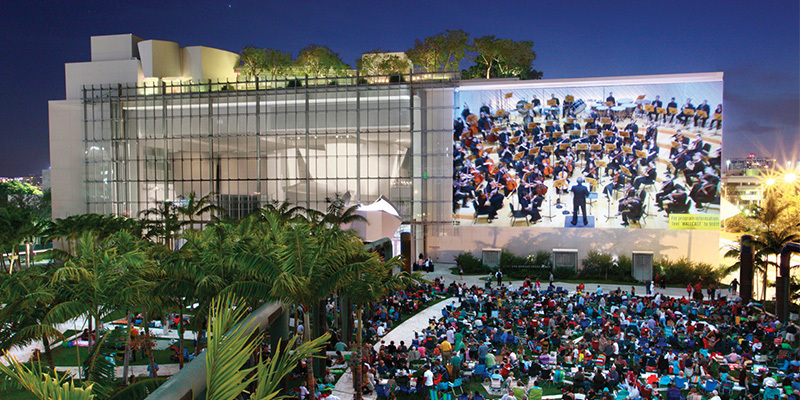 We hope to make the Wallcast concert on Dec 12th in South Beach. 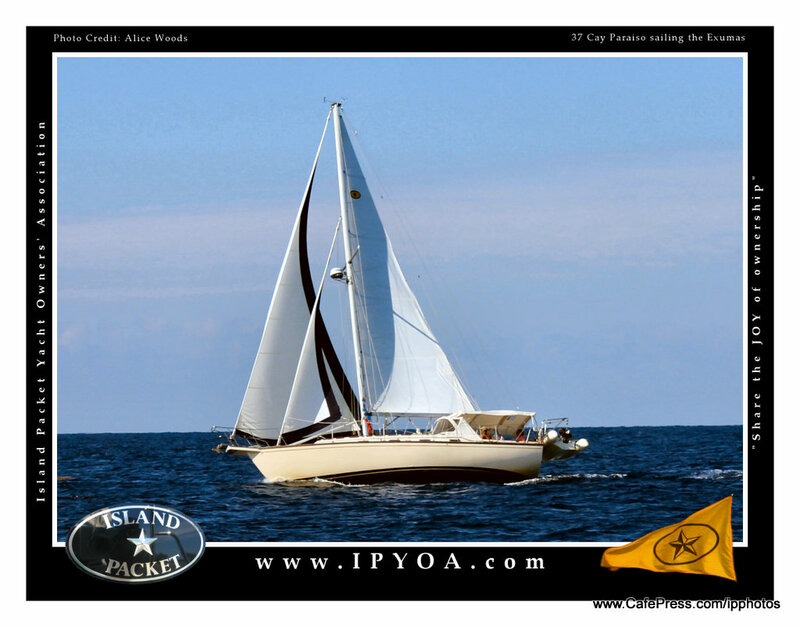 During all of this activity, I have been working very hard on a major web site project where we have combined the Island Packet Photos web site of 11,500 photos into my IPYOA.com web site that had 5,000 photos. 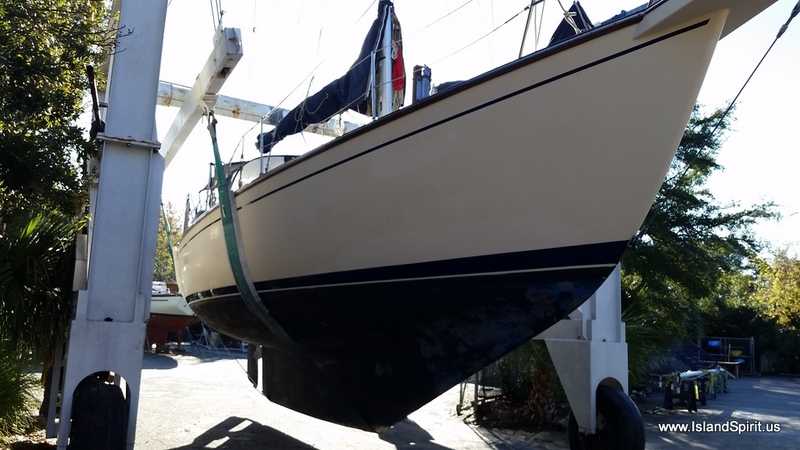 This project has been going on since the Annapolis Maryland Boat Show of Oct 9th, 2015. We worked on it as we drove down the ICW daily! We have finally finished it and we are now working out the glitches and bugs. 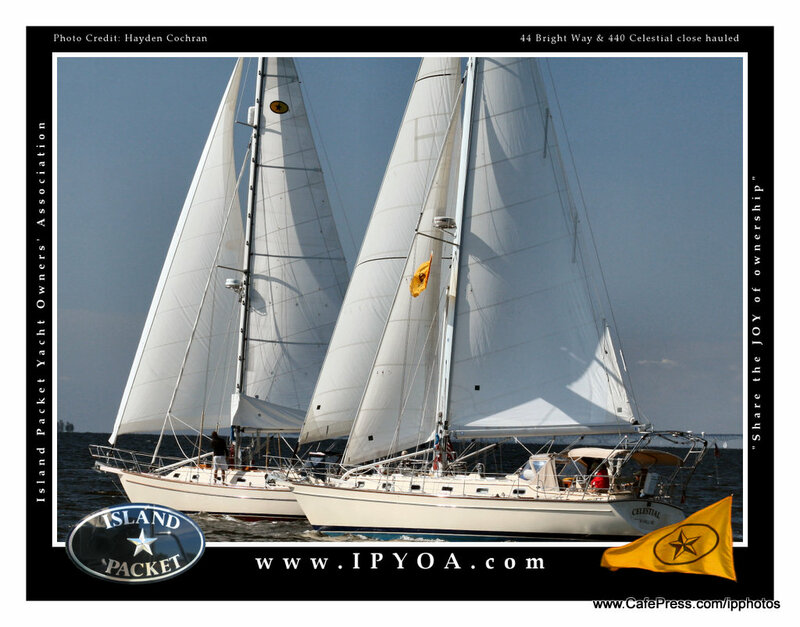 The site now holds 16,000+ photos of Island Packet Yachts shared by IP owners that want to share photos. The site is visited by thousands of visitors a month, and the server is sending out 20,000 pages each month. 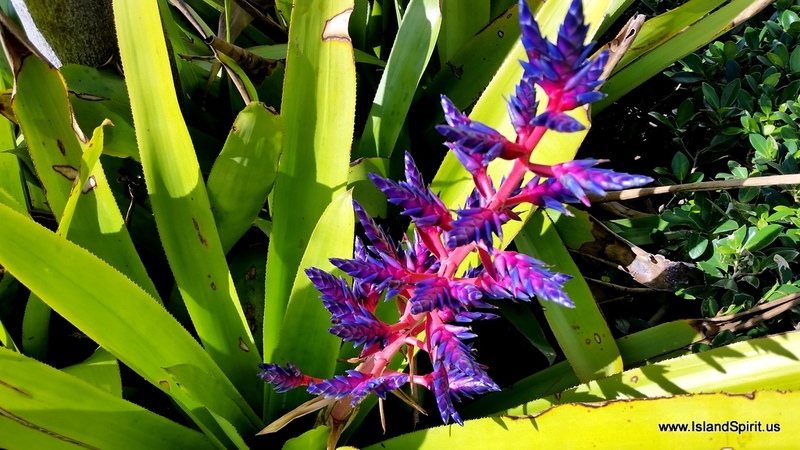 We think it is fantastic and we invite you to take a look and get involved at www.IPYOA.com/photos. As you can see, we have been working on a few fun proyects! As everyone always says, it is the friends and boat buddies along the way that make this so enjoyable. 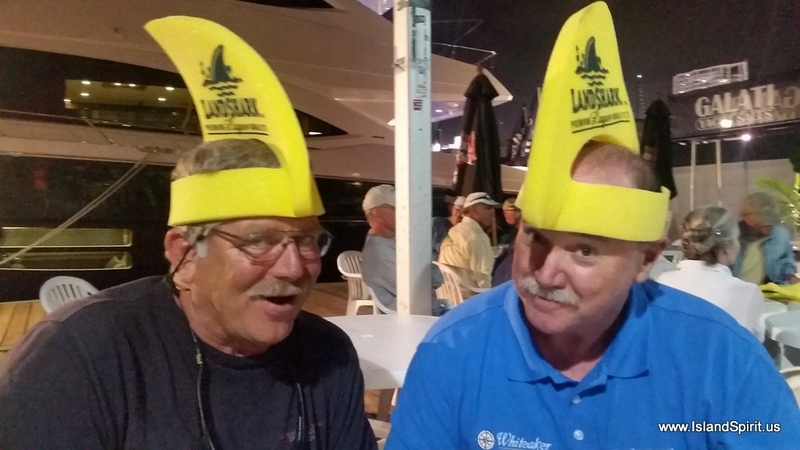 We have really enjoyed spending quality time with so many of our sailing friends as we all move down the waterway and towards the Florida Keys and the Bahamas. 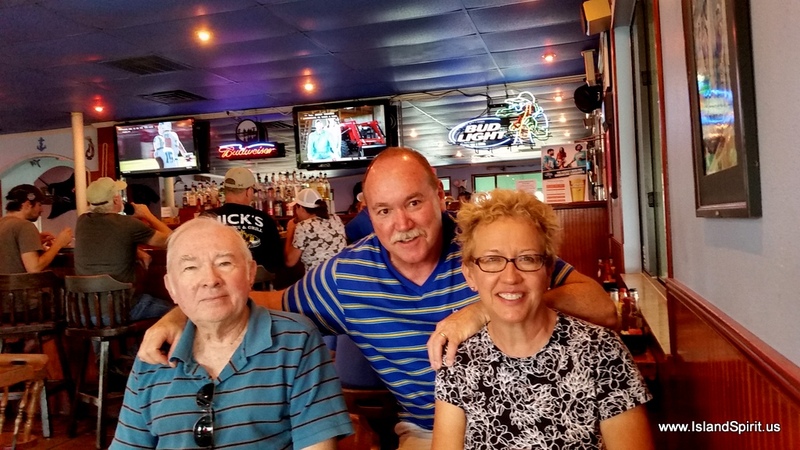 A special time was a fun Sunday at Carey’s, with Julie, Eric and Pat, watching football, playing many lively games and dining very well. Who knows when or where we will bump into you all again? 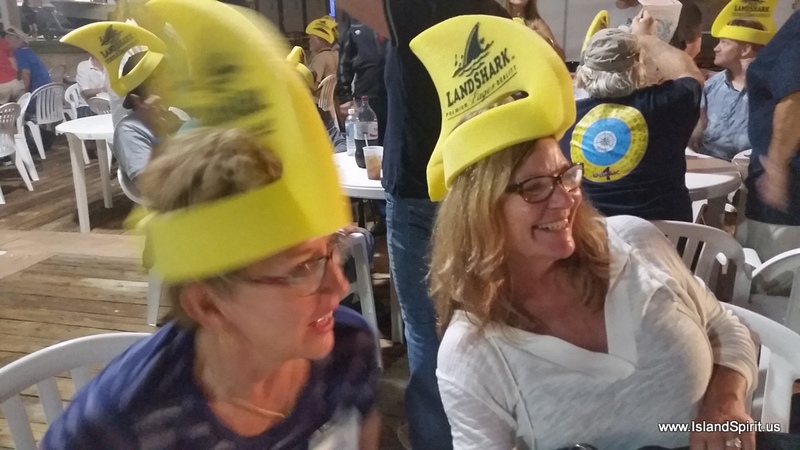 Here are more photos to share of all our happenings. During our time in Vero, good friends Michele and Joe of IP 37 SIMPLE LIFE invited us over for cocktails. 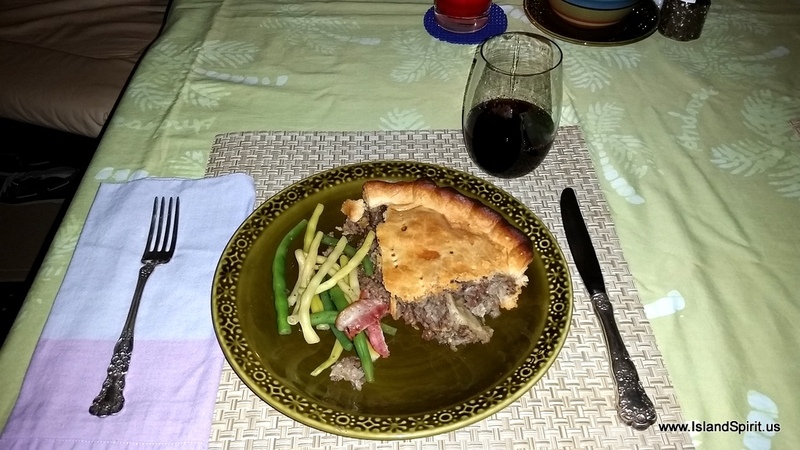 Well, they pulled a fast one on us and the next thing you know, Michele served a most delicious French Meat Pie coming out of the oven with the table all set for dinner. WOW, this was a real treat. Thank You, Michele and Joe. We have followed these two for years and we lived with Michele’s cruising book from 2003 on our coffee table. 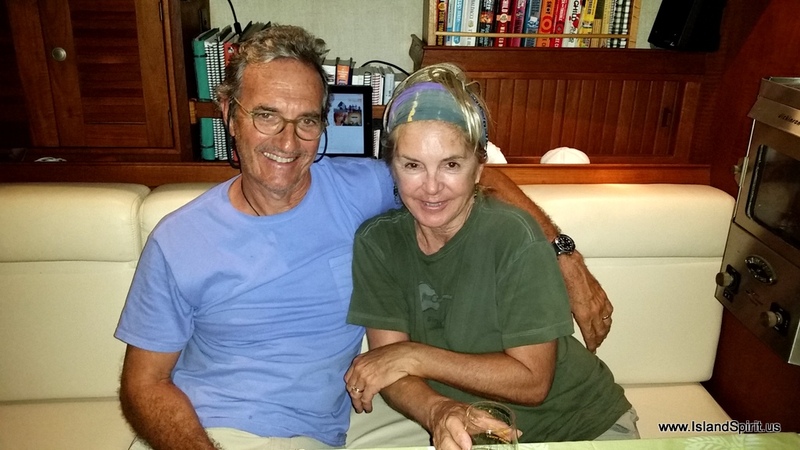 Michele published a book about their year of cruising from Rhode Island to the Exumas and back. We were inpsired by her book, saying someday, someday, we, too, will do exactly this. Well, some day is here, and we are living their book. What a joy to spend time with these two great people. Thank you! We are living a dream, we know it, we are grateful every single day to be fully involved in all we are doing. Thank you all for following along and for your comments and emails.